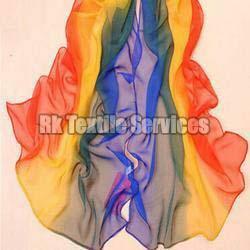 Established in 2004, RKTS has earned an immense repute in the area of fabric trading, across the globe. Ours is a licensed entity, operating as an exporter, importer and supplier of georgette fabrics from RKTS Surat (Gujarat, India). Being a quality-centric entity, we are offering a superior quality and beautiful array of Georgette Fabrics. Offered fabric is spun by adroit professionals using contemporary machines and skin-friendly threads, at our client’s place. Obtainable in varied colours, designs and patterns, this fabric is the best suited for designing different elegant attires. Our clients can purchase this fabric from us at nominal prices. Owing to our scheduled operations and dependable solutions, we share forefront amid the leading georgette fabrics exporters.